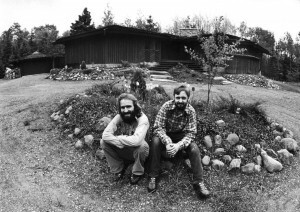 The History of Meteek & Co.
Back in the 1970s, two young rapscallions, Randy and Rolf Larson, started building houses. Their first home was a design of three interlocking timber-framed hexagons, and they never looked back. Meteek Shop & Construction was born. After a few years in Duluth, Randy left for the wilds of Seattle to build houseboats and other crazy, fun projects with Paul von Rosenstil. Rolf headed off to Boston and became a structural engineer. Returning to Duluth, Randy changed the name to Meteek & Co. to encompass the range of commercial, energy efficiency and forensic consulting projects he took on. Now with a team of employees and partnering businesses, Randy and Meteek continue to build houses, innovate solutions, and increase their capacity for fun.